Located in the heart of Rosslyn and just blocks from the Potomac River is a giant 341-unit condominium that is distinctive for its modernity and abundance of glass, with soaring window walls and dramatic atrium rooms that seem to bring the indoors inside. Completed in 1986, the towering structure seemed far ahead of its time when built, and continues to be a highly sought-after source for desirable luxury condos for sale. 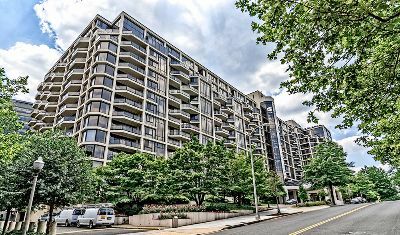 Located at 1530 Key Boulevard in Arlington’s popular Rosslyn neighborhood, The Atrium condos sit directly across from Rosslyn Highland’s Park, and less than three blocks from the Rosslyn Metro station. List prices generally start around $350,000 for one-bedroom units and climb all the way to $1.5 million for stunning three-bedroom, two-story Penthouse homes. Condos for sale in this unique structure feature a combination of hardwood and carpet, with open floor plans, spacious kitchens, large balconies and the signature floor-to-ceiling windows that offer such dramatic views of the river and the Washington, DC skyline. But what else do you get at The Atrium condos for sale in Arlington VA? Glass elevators, a cascading fountain, 24/7 desk and concierge service, a huge swimming pool, sauna, Jacuzzi, and tennis courts. Want more? Add a state of the art fitness center with whirlpool, secure parking, extra storage, on-site dry cleaners, an entertainment room and a private green space with gas grills and picnic tables. Plus, the building is pet friendly! And then there’s the neighborhood itself. Rosslyn—known in the 1800s for gambling and houses of ill-repute—now anchors the highly desirable Ballston-Rosslyn corridor from the river’s edge, and is known for its shops, entertainment and a diverse blend of food. You can dine at Café Asia or Piola, or maybe you want to grab some sinfully great grub at Ray’s Hell Burger and bring it back to eat on your private terrace! For those looking for luxury condos for sale, in a veritable greenhouse high-rise, check out the Atrium, where soaring spaces and breathtaking views are the norm.